The benefits of cycling - low cost, noise free, no emissions - are well known in the Czech Republic. Cycling also promotes healthy living by drawing people out of their homes and cars and exposing them to outdoor environments; while simultaneously reducing the pollution and inconvenience of traffic jams and increasing tourism. Yet until recently, lack of adequate bicycle storage, lack of access to bike repair facilities and a general lack of adequate facilities to cater for people who do frequent strenuous activity like cycling were key barriers to increasing and supporting cycling in the Czech Republic. 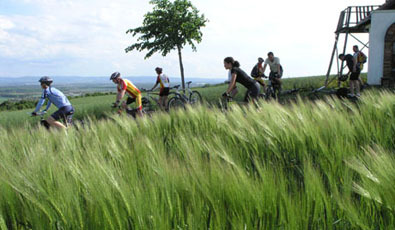 The Cyclist Welcome project is an exciting initiative that provides and continues to establish proper facilities to support cyclists and sustainable tourism in the Czech Republic. The Cyclist Welcome project is a nation-wide program that aims to establish, evaluate and inspect cycling-related services and facilities throughout the Czech Republic. The project was initiative by the Czech Environmental Partnership Foundation, Nadace Partnerství. Founded in 1991, Nadace Partnerství is the leading Czech foundation supporting sustainable development projects in the Czech Republic. As part of its mission to “support NGOs, municipalities and other partners in their environmental care, promotion of sustainable development, inter-sector cooperation and participation of citizens in public affairs” the foundation established the Cyclist Welcome program in 2005. The Cyclist Welcome program works by identifying and certifying accommodation, gastronomy and tourist destination establishments that complete a set of biker-friendly certification standards. For example, accommodation facilities like hotels, B&Bs and chalets are required to offer healthy breakfasts and amenities for cyclists to wash and dry their clothes. Campsites and bungalows must offer separate zones for cyclists and non-motorized guests, no-fee parking for cyclists, one-day bike tours during the day and provide adequate lighting on access roads near the site. Gastronomic institutions such as restaurants, pubs and wine establishments are required to provide affordable, refreshing “bicycle drinks” and lunch packs as well as fruits and herbal teas.>They are also required to offer at least one non-fried vegetarian meal on a menu written in at least three languages during open hours. Finally, tourist destinations such as castles, chateaux, museums and natural sites must sell biking and tourist maps nearby and offer information in multiple languages. All establishments are required to provide bicycle lock-boxes and other safety/storage facilities, basic bike repair tools, a first aid kit and access to the Cyclist Welcome information board. Once these requirements have been fulfilled, certification is established with a green and white smiling-bike logo and the facility is listed in the Cyclist Welcome database. The first logo was awarded in Spring of 2006. The Cyclist Welcome certification standards are comparable to those set by similar biker friendly programs such as Germany’s Bett & Bike and RADfreundliche Betriebe in Austria. It's no longer accessible through the NaKole website, but instead via its own dedicated site www.cyklistevitani.cz - there's small flag logos on the page to select your language (English, German or Czech). Many thanks, Ian! I have updated the web link.